Triceratops Soft Tissue: Osteocytes with filipodia no less! 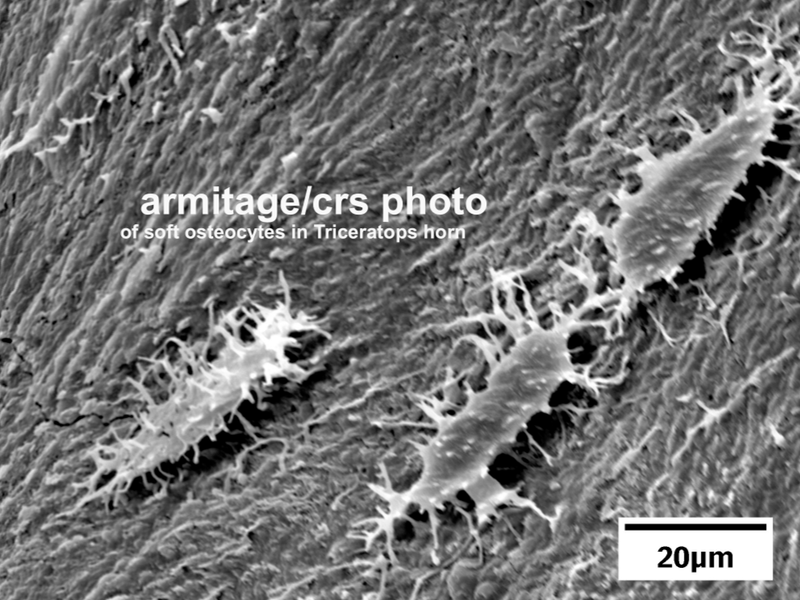 * Interview & Photo from iDINO's Mark Armitage: Fulfilling last year's promise, Mark Armitage of the CRS iDINO project presents Real Science Radio with a formerly unpublished photo (right) of soft tissue in a Triceratops horn. It's beautiful! (Well, in the eyes of the beholder, anyway. But God Himself probably thinks it's pretty cool too!) Armitage, a Creation Research Society board member and microscopy expert, along with iDINO microbiologist Dr. Kevin Anderson, excavated a Triceratops horn from the Hell Creek Formation in Montana. As with scientists from Harvard, North Carolina State, and dozens of other universities and institutions, they broke it open and... Guess what! * Armitage and Anderson at Acta Histochemica: One of the latest of hundreds of peer-reviewed papers published by Darwin Doubters and even by (say it's not so) creationists, the prestigious secular journal Acta Histochemica has published the paper by Mark Armitage and Kevin Anderson titled, Soft sheets of fibrillar bone from a fossil of the supraorbital horn of the dinosaur Triceratops horridus in Volume 115, Issue 6, July 2013, pp. 603–608; Mark Hollis Armitage, Department of Biology, California State University, 18111 Nordhoff Street, Northridge, CA 91330-8303, USA; Kevin Lee Anderson, Department of Biology, Arkansas State University Beebe, Beebe, AR, USA. * Armitage Dinosaur Prediction Confirmed: The science prediction by Armitage in this video, uploaded to YouTube in December 2014, was confirmed in June 2015 when the journal Nature Communications reported that endogenous (original) soft tissue was found in six of eight dinosaur bones investigated, leading to the conclusion that "preservation is more common than previously thought." As co-author of one of the primary papers In a prestigious peer-reviewed science journal documenting dinosaur soft tissue, Mark said about this finding: "My prediction is this. The fossil record is full of soft tissue. This is the norm, rather than the exception. That's my prediction." 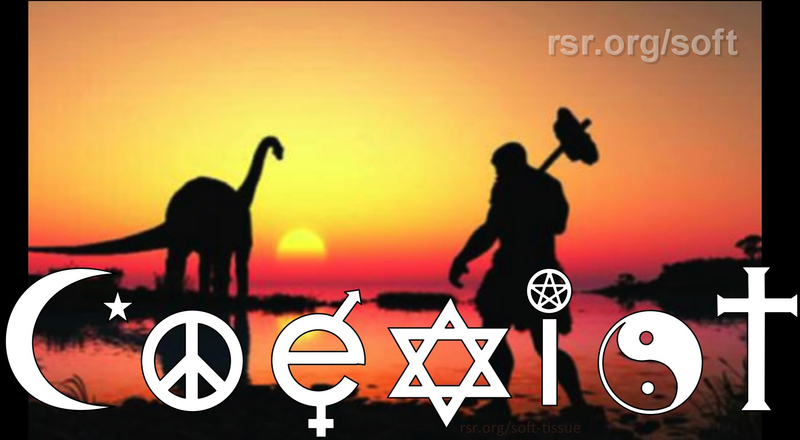 This was an independent record of the obvious implications of biblical creation, for at rsr.org/predictions, also in 2014, we published our own prediction: "Dinosaur soft tissue will be found not only in rare circumstances, but rather easily, i.e., when looked for." CONFIRMED! - Cal State Scientist Fired for Dino Photos, Now on RSR. - 2016 Update: Armitage won a half-million dollar settlement for his unlawful termination/religious discrimination lawsuit against California State University! Congratulations Mark! * Whose Expectations Are Met? Evolutionary expectations are based on their belief in millions of years, whereas based on Egyptian mummy research, young earth creationists do expect some dinosaur soft tissue preservation. And see science deniers and science doubters including (even as late as 2013) PZ Myers, at rsr.org/soft-tissue-doubters. Today’s Resource: Get the fabulous Carl Werner DVD Living Fossils and his great prequel, Evolution: The Grand Experiment! And have you browsed through our Science Department in the KGOV Store? Check out our Hydroplate Theory On the Air and you just might love Bob Enyart’s Age of the Earth Debate and the superb kids' radio programming, Jonathan Park: The Adventure Begins! We offer a 30-day money back guarantee on all purchases. * Creation at Denver Bible Church on Oct. 6: Pastor Bob Enyart invites you to visit Denver Bible Church especially this Sunday morning at 10:50 a.m. to worship with us and then to see Bob's creation/flood presentation! * Creation in Denver on Oct. 11: Bob Enyart invites you to visit Denver's Rocky Mountain Creation Fellowship especially this coming Friday, Oct. 11th at 7 p.m. to see Bob's presentation on creation and the global flood!